Seven people are dead and more than 670 were injured in the violence, as several officials resign in protest. Thousands of supporters and opponents of Egypt’s President Mohamed Morsi clashed in the streets around the presidential palace Wednesday, hurling rocks and Molotov cocktails and firing birdshot at each other in the largest outbreak of violence between rival political groups since the revolution began. Seven people were killed and more than 670 injured, according to the Health Ministry, as Cairo’s affluent Heliopolis district was transformed into a scene of chaos and bloodshed. The clashes spread outside of Cairo, erupting in Alexandria and Mahalla. The offices of the Muslim Brotherhood were set ablaze in Suez and Ismailia. The street battles marked a major escalation in the crisis that erupted on November 22, when President Morsi, who hails from the Muslim Brotherhood, issued a constitutional declaration that granted him near absolute powers and placed him beyond the review of any court until the ratification of a new constitution. The decree united Morsi’s fractured non-Islamist opposition and sparked some of the largest street demonstrations in Egypt since the ouster of Hosni Mubarak. Tens of thousands gathered in Tahrir Square and launched a mass sit-in to oppose Morsi’s seizure of power. Meanwhile, thousands of judges—including the leaders of Egypt’s highest appeals courts—launched a strike in protest. Morsi and the Brotherhood responded by doubling down on a strategy to force the transition process and hastily called for a final vote by the Constituent Assembly on the draft constitution. Nearly all of the 100-member body’s non-Islamist members, including representatives of the Coptic Christian Church, had already withdrawn from the assembly. In a marathon, seventeen-hour session broadcast on state television, assembly members—nearly all of them Islamist—passed each of the 234 articles of the constitution in near unanimity, finally ending at 7 am the next day. Critics blasted the process as reminiscent of the Mubarak era, when the regime would ram legislation through the parliament. The text itself has come under criticism for restricting certain freedoms and containing vague language that lawmakers could use to curtail rights. The Brotherhood, allied with other Islamist groups, followed the passing of the constitution with calls for a massive rally in Tahrir on December 1 to show their support for Morsi and the draft constitution. The prospect of Brotherhood members entering Tahrir during a mass sit-in by their opponents sparked warnings of potential violence, and the Brotherhood eventually backed down, announcing they would move the gathering to Renaissance Square outside Cairo University to avoid bloodshed. Tens of thousands turned out for the massive rally—many of them bused in from governorates across Egypt. “This constitution is the best one in Egyptian history. It ensures the freedoms of citizens without violating Shariah law, and it protects the revolution from the remnants of Mubarak’s regime,” says Gamal Mohammed Abdel Galid, a school teacher from Tanta, a town in the Nile Delta who attended the rally, and a member of the ultraconservative Salafi Nour Party. That evening, Morsi officially received the draft constitution from the Constituent Assembly in a televised ceremony and called for a national referendum to be held on December 15. Morsi pledged that the constitution, if passed, would supplant his constitutional declaration and his near absolute powers would be rendered void, setting the stage for parliamentary elections. It remains unclear what would happen if the referendum is voted down, with no clear plan from the presidency. Morsi’s opponents charged that the referendum posed a false choice between accepting a constitution drawn up without their representation or a return to Morsi’s near-absolute powers under the November decree. As the political divide deepened, Morsi’s opponents opted to escalate their protests, choosing to march to the presidential palace on December 4. While Tahrir Square filled with demonstrators, tens of thousands headed towards the presidential palace, where riot police were waiting behind barbed-wire barricades. After firing several tear gas rounds, the police fled the scene, overwhelmed by the sheer size of the march. A sea of men, women and children surrounded the palace walls in the largest demonstration of its kind. They chanted against Morsi and the Brotherhood, reviving the same language and rhymes popular during the uprising against Mubarak. Graffiti covered the walls of the vast compound mocking Morsi and the Brotherhood. Morsi himself left the palace in a convoy. While the official political demands remain for the president to reverse his constitutional decree, suspend the referendum and form a new constituent assembly, the anger of the crowds has risen further, with people calling for Morsi to step down. Some 200 protesters set up tents outside the presidential compound, where they spent the night as part of a new sit-in. The next day, the Brotherhood and other Islamist groups announced they would stage a million-man counter-demonstration at the same location in support of the president and his decree. By 4 pm, thousands of members of Islamist parties and their supporters arrived at the presidential palace. According to eyewitnesses they quickly forced out the several hundred people engaging in the sit-in, destroying tents and, in some cases, beating protesters. As Morsi’s supporters were violently clearing the area, his vice president, Mahmoud Mekki, was holding a press conference, saying “the door for dialogue” remained open. 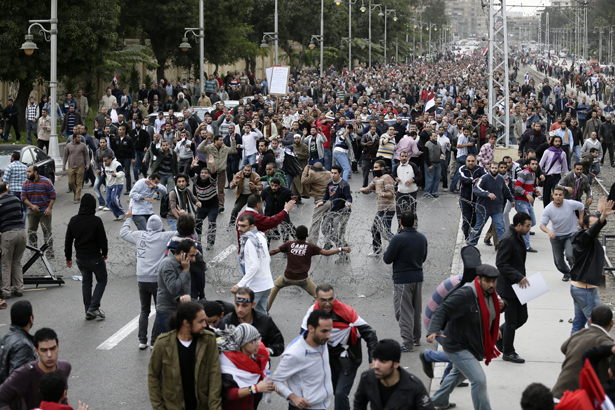 Anti-Morsi protesters regrouped on several side streets leading to the presidential palace, and their ranks steadily grew with people joining them to retaliate against the Brotherhood attack. Clashes ensued with thousands hurling rocks and Molotov cocktails at one another in running battles. Small fires raged, and sidewalks were ripped apart as protesters gathered rocks to hurl. Shots rang out and protesters wounded by birdshot began appearing at field hospitals set up nearby. Both sides accused the other of being the aggressor. The police were nowhere to be seen. When they did arrive, in six trucks filled with Central Security Forces, throngs of revolutionary youth—who had faced off against the police numerous times and lost friends to police bullets—forced them to turn around and retreat. Meanwhile, Mohamed El-Baradei, the Nobel peace laureate and former United Nations diplomat who was chosen as coordinator of a newly unified secular opposition, blasted Morsi’s government. “Regime leading Egypt into violence & bloodshed,” he wrote on Twitter. The fallout from the clashes was significant. Five presidential aides to Morsi resigned, blaming him for the violence. They joined three other advisers who had resigned a week earlier following the decree. The head of Egypt’s TV sector, Essam Al-Amir, handed in his resignation saying, “I resigned in protest at the general administration of this regime.” Meanwhile, Zaghloul Al-Balshy, secretary general of the high elections committee and assistant to the Justice Minister, announced he will not participate in monitoring the referendum, and more than 200 diplomats said they will not supervise voting by expatriates, scheduled to begin in embassies around the world on Saturday. By the following morning, tanks from the special presidential guard took up positions around the palace and declared they would clear the area to prevent any more demonstrations near the compound. Morsi, who has not appeared since setting a date for the referendum five days earlier, is scheduled to deliver a televised address. Yet many wonder what he can say, short of offering significant concessions to defuse a deep political crisis that is now manifesting itself in large-scale street clashes and threatening to seriously damage Egypt’s social fabric.